Just a quick post as first real day back at work, lots to do and I dont want to get spanked, well not just for now. After Friday, Saturday and my yummy maintenance spanking yesterday my bottom needs a rest. It's a little on the tender side I noticed in the shower this morning, and still has a pink hue to the flesh. P thinks my bottom is at it's best when it looks this. Said I would post a pic of the paddle he used on Friday. He tells me bought it a while back from Leatherthorn Paddles (John), dark horse that he is, and kept it under wraps. What a waste! I thinks its lovely, didn't quite feel like that on my bottom. Thats quite pretty, in a scary kinda way. Three spankings! You lucky thing, I only got one. 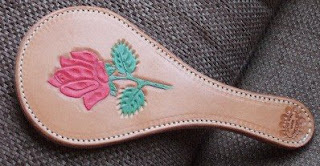 Oh that is a beautiful paddle, if it really stings, I think I will just stay with my Pink Bad Girl Hand Paddle. It's hard to get back to the regular works schedule! A beautiful paddle for a beautiful girl! And if it didn't sting, it wouldn't be nearly as appreciated, but I do agree that it's a waste to let a gorgeous implement like that sit around with no bottom to warm! Jay - I know you did, I just popped over, you should know better than fib to Paul. Andrades hi – It does sting, there are certainly some lovely toys about. I am looking forward to your next few posts, I hear you have had a couple more spankings. I know what you mean about today it’s been quite a struggle. Tiggs hello, your very kind, yes it is quite beautiful. I have definitely decided, leather not wood for me. I have to ask....if the decorated side was used or or not....can just imagine it brought 'roses to your cheeks'!! Ronnie, we have that same paddle. It is my favorite, after years of wear and an exposure to wood. You need to take the time to break it in! M:e hello, nice to meet you, thanks for stopping by. I love that "roses to your cheeks"
Sara, welcome, We have used many toys in our years together but I think this one could definitely become one of my favourites. I will mention to P that he needs to break it in a lot. I think the paddle is beautiful too! I have often looked at it and dreamed when I have been window shopping. Maybe someday. I'm glad you like it. Hey PK thanks for coming by. It is isn't it. A lovely choice of Ps. Maybe one for your birthday or Christmas list. I'm hoping I will get more acquainted with it very soon. PS - I'm working on a FF story but probably will take me ages but I'll get there. I own three of john's paddles. I think they are just absolutely wonderful all. I'd like to have one of everything and have thought about asking him to make me a flogger too.